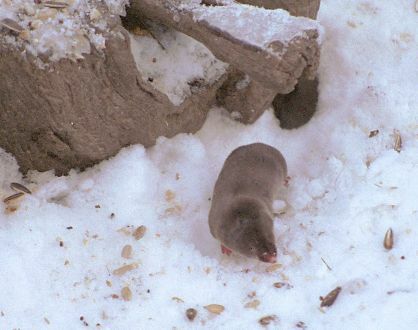 Shrews are very active small mammals. They can be separated easily from mice by their short velvety fur, pointy nose and tiny eyes. Because they prefer to forage underneath leaf litter or snow they are more often heard than seen. Listen for their very high pitched shrill chattering and squeaky squeals. Northern Short-tailed Shrews are regular visitors to our feeders. This shrew was photographed at the centre's feeder by Anne Barbour.